Fish sculptures with electromagnetic field sensors to create a soundscape in Kleiner Salon as an aquarium. 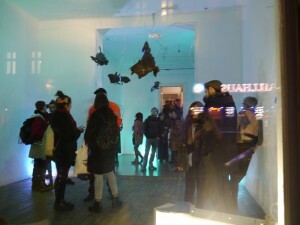 Coelacanth is about reflection and perception, about the competition between two languages mediating complexity. One is the language of science. The other one is the language of art which has to understand science but doesn‘t want to become it. The idea of what good science is or should be, the images of science and scientificity, are difficult to grasp but no less significant for it. Anthropologists and zoologists do not take the research of cryptozoology seriously. They consider it to be dubious because, in their opinion, scientific methods are not respected. Nevertheless, the strictly traditional scientific community had to make some concessions to cryptozoology: for example, the Coelacanths were initially regarded as a myth of locals until their discovery by Marjorie Courtenay-Latimer in 1938.